It says I create those things; I guess I do. I have realised long ago that for a small blogger like me, both in physique and blogging capacity and influence, it is difficult to grow if you’re depending only on a certain form of monetisations. The most common and which I’m using being advertisements and affiliate programme. I haven’t tried product sponsorships where you receive free products to make a review of; I have a few reasons why, but that’s another story. Anyway, I have decided go a bit further with my blog and hopefully grow it. For that, I felt I needed to diversify my possible stream of income, and have chosen to use Patreon as a platform to manage sponsorships for my blog. The sponsorship here is slightly different. 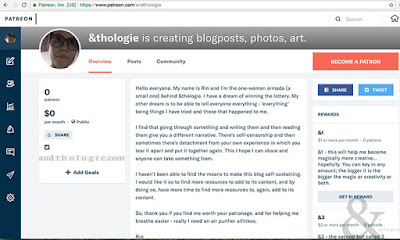 Unlike the usual business-to-blogger or business-to-ad-network-to-blogger sponsorship, on Patreon, regular people or consumers of products produced by creators, be it blogposts, videos or art, choose to sponsor those creators by being a patron and make monthly contributions. Signing up is free and after which you are automatically a patron. You can stay that way and look for people to sponsor or you can create a creator’s page to receive sponsorships. The process took some time for me as I like to get to know everything I possibly can before signing up. The good thing is Patreon has a way of explaining things which makes everything simpler; even their terms and conditions [T&C] are fun to read, well as fun as you can get reading a T&C, but certainly not the long-drawn I-understand-the-words-but-not-the-sentence type of T&C. The only button available by way of patronage [or the other way round]. 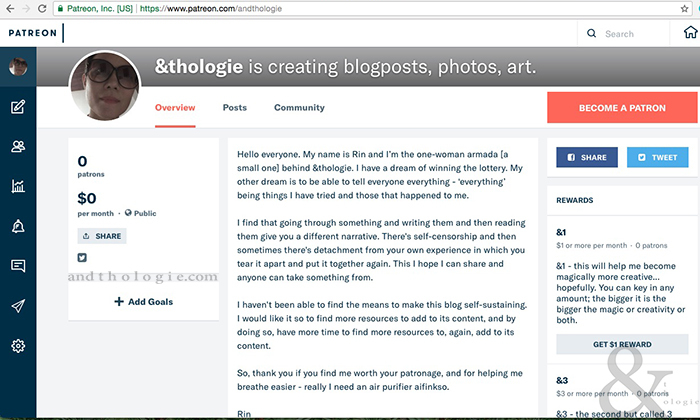 I had been sitting on my Patreon page for about a week; editing and reediting it even if the page was already ‘live’. I had a problem with the ‘reward’ part; whether or not to offer one and what to offer since they say that creators who offer them are 1.5 times more likely to get patrons or sponsorships. But here I wonder if the likelihood of getting a patron is not because of the rewards offered but because of the way the button that says ‘Become a Patron’ [which is the only button available if you don’t offer any reward] might give an impression that it goes to a sign up page to become a patron instead of sponsoring the said creator, as opposed to the reward button[s] which is clearly calling to action such as the ‘Buy’ button on an online shopping store. But then maybe that is just a newbie mistake on my part and experienced patron are well aware of that. Anyway, I’m trying to get to know Patreon a bit more and adding more options, such as goals, as I go along. I don’t expect to get a sustainable income so soon, or at all; you will still need to promote your page and basically look for patrons yourself. I also need to have more contents and post regularly before that can happen. In the meantime, if you like the idea of this patronage thingy and would like to sponsor me [patronising is also allowed but not encouraged], please head over to my Patreon page. Thank you.